We rarely feel moved by events in the second division, but it’s hard not to feel a twinge of excitement at the prospect of Northamptonshire and Leicestershire playing out a draw next season to extend their respective winless streaks. We’ve reported on both of these clubs in our latest Shire Horse column for All Out Cricket – plus some other stuff. 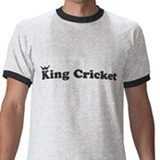 County cricket in the internet age: how can it generate an income? That’s the Middlesex difference. Good to see Sam Robson putting in the hard yards, too. 11-4 – are those the odds now for us (Middlesex) to drop? Let it never be said that celebrities are prone to overreaction. I do like a nice Hyderabad biryani myself. MSD has my sympathies. Ged, if you’re going to bombard us with photos of your food, do it properly and write us a match report to go with it. …and part of this one was later that same day. If you click on the first of Ged’s links, the Flickr one, then click onto the next photo, you get a virtual definition of “nicely drunk”. Well done Daisy. In your faces, losers! All three (count ’em!) Second XI trophies! See, nobody was able to coax Matt Boyce away. Can we talk about Jos Buttler and Twenty20 a bit?